Under the Alaska Native Claims Settlement Act (ANCSA) 14(h)(1), all Regional Corporations were able to select lands for historic and cemetery sites. Land selections were not a part of the ANCSA village land entitlements. They were made on unappropriated federal land outside of the boundaries of Village Corporation lands. The sites had to be on land not privately owned, not selected under any other section of ANCSA, and not set aside for federal systems under ANCSA 17(d)(2). The deadline for filing for the historical and cemetery site applications was December 18, 1975, but extended until December 31, 1976. Many historical sites are scattered throughout the Calista Region, some of which are hundreds or thousands of years old. The U.S. Department of Interior established the criteria for site selection. The Bureau of Indian Affairs created an ANCSA Office to carry out its statutory duties to investigate and certify the sites. The National Park Service had an early consultative role, contracting with the University of Alaska to hire professional anthropologists, archaeologists and historians to assist in the evaluations. This obligation transferred to the BIA in 1983. The sites were identified from oral and written accounts and through personal interviews with residents and Elders in the villages. 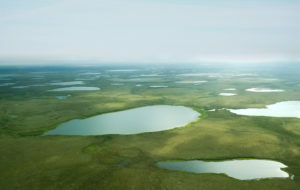 The BIA began field investigations in the YK Delta in 1978. To date, the BIA ANCSA Office has generated roughly 1,300 taped recordings with Native Elders in the Calista Region, mostly in Yup’ik or Cup’ik. Tunista Construction, a Calista subsidiary, contracted with McClintock Land Associates, Inc. (MLA) in 2011 to perform the Cadastral Survey of some of the Historical Sites under P.L. 93-638, the Indian Self Determination and Education Act. Local hire is the main advantage of a “638” Contract. An ANCSA Corporation or Tribal organization controls the contract and can ensure local hire and use of local services. More of the costs for the project are pumped directly into the local economy rather than going elsewhere. The project was conducted in two phases in the Calista Region. The first took place in the summer of 2011 based out of Saint Mary’s; 46 historical sites were surveyed, and 228 corner markers were set. These surveys covered an area from Nunam Iqua to Kalskag and from Saint Mary’s to Bethel. The second phase, in the summer of 2012, was completed by moving base camp from Sleetmute to Chevak and on to Bethel. The project was huge. The sites were spread out over an area from Lime Village to Scammon Bay and Nunam Iqua to Kipnuk. Transportation of the three, two-person crews required two helicopters. Local workers, Ryan Bukowski and Gabe Nanok joined the MLA staff. They not only helped with the survey but helped determine the location of sites difficult to find. Along with a BLM employee, MLA consulted the village Elders who provided further input on site locations. In this second 2012 phase, 88 historical sites were surveyed, and 516 corner markers were set. 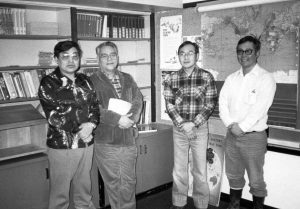 Calista Board of Directors in 1983, M. Moore, R. Christiansen, Nelson Angapak, and P. Guy. Accomplishing the survey of ANCSA lands is an essential step for corporations to receive final patent to lands, and local contracting for the survey of these lands using local resources is an added incentive for ANCSA Corporations to participate in the 638 surveys. When Calista formed after ANCSA, the corporation used resources to support village corporations. Calista provided data and information so that village corporations could select and preserve lands.